· Take 6th Avenue / Route 764 South to the "Duncansville Intersection", where 764 intersects Route 22 (Pizza Hut and the former Riverside grocery store are on the corners.) Turn left onto Route 22 East / Third Avenue. Go straight, through two signal lights, past Sunbrook Manor Drive. The building is on your right, and is a blue building with a grey awning labeled "Duncansville Professional Center" (see photo.) Turn right after the building onto Cedar Heights Drive, and park in the rear, then use the front door to enter the building. · Take the Plank Road exit South off I-99. Take Business Route 220 South past the Wal-Mart plaza, then the Hollidaysburg Veteran's Home, to the "Meadows Intersection". Continue straight on Business Route 220 through two more signal lights, to the intersection of Business Route 220 and Route 22, at the Wye Switches. Turn right on to Route 22 West (turns into Third Avenue.) Go straight, through one signal light and past Sunbrook Manor Drive and Fine Cut hair salon. The building is the next one on your left, a blue building with a grey awning labeled "Duncansville Professional Center"(see photo.) Turn left just before the building onto Cedar Heights Drive, and park in the rear, then use the front door to enter the building. · Take Route 22 West towards Duncansville. Pass the turn off for Business Route 220 at the Wye Switches. Go straight, through two signal lights and past Sunbrook Manor Drive and Fine Cut hair salon. The building is on your left, a blue building with a grey awning labeled "Duncansville Professional Center"(see photo.) Turn left just before the building onto Cedar Heights Drive, and park in the rear, then use the front door to enter the building. · From Ebensburg, take Route 22 East toward Altoona and Hollidaysburg. Take the Cresson exit, turning right onto Business Route 22. Go approximately 8 miles to the "Duncansville Intersection", where Route 764 intersects Route 22 (Pizza Hut and the former Riverside grocery store are on the corners.) Go straight on Route 22 East / Third Avenue, through two signal lights, and past Sunbrook Manor Drive. 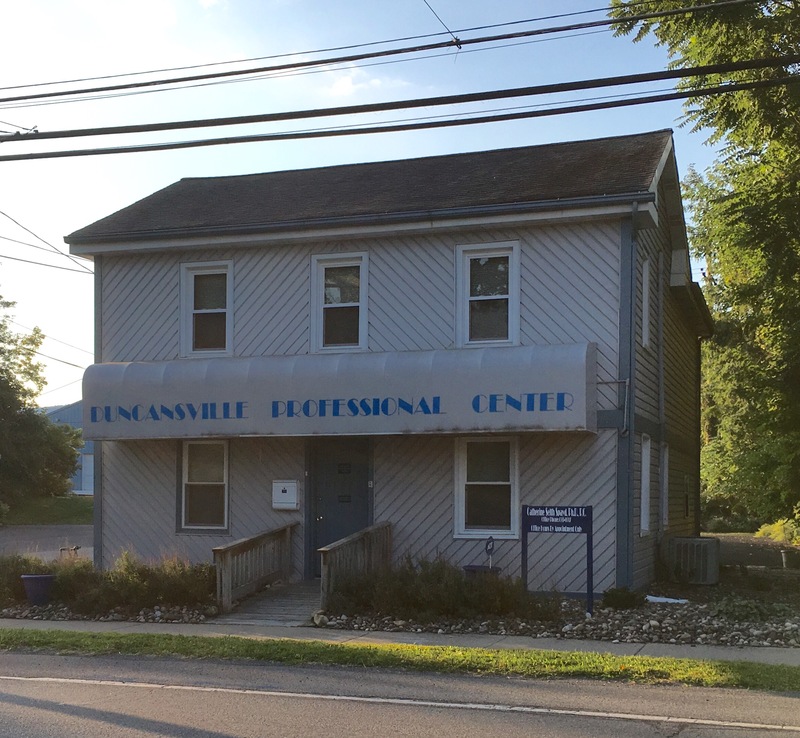 The building is on your right, and is a blue building with a grey awning labeled "Duncansville Professional Center" (see photo.) Turn right after the building onto Cedar Heights Drive, and park in the rear, then use the front door to enter the building. · Take I-99 North toward Altoona, take Route 22 Ebensburg / Hollidaysburg exit off I -99. Take the next exit, East 22 / Route 764 Hollidaysburg / Duncansville, then the next exit, South 764 Hollidaysburg / Duncansville. Take Route 764 South to the "Duncansville Intersection", where Route 764 intersects Route 22 (Pizza Hut and the former Riverside grocery store are on the corners.) Turn left onto Route 22 East / Third Avenue. Go straight, through two signal lights, and past Sunbrook Manor Drive. The building is on your right, and is a blue building with a grey awning labeled "Duncansville Professional Center" (see photo.) Turn right after the building onto Cedar Heights Drive, and park in the rear, then use the front door to enter the building.